I spent a couple of very quick days with my mom and daughter up at the Vermont Quilt Show. It's a 4 hour drive from me, up through all the NH and VT mountains. The show itself has a decent variety of quilts...some pretty good, some really good, etc. There is no jurying of entries, so if you are fast to mail your entry in, you will be in. 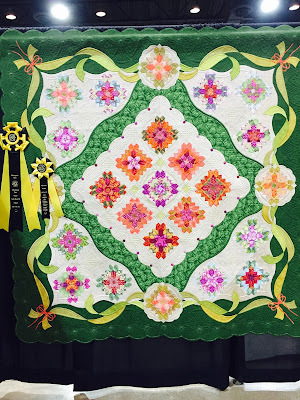 It is a far cry from the Houston and Paducah quilt shows, and even the good machine quilting shows, but it is a noce local and regional show. I like the show because I run into many folks that I know (but heck, I do that at every show). Inappropriate comments on judging sheets last year burnt many bridges for them. Some things can't be said if you want to get good entrants and sponsors. Springtime in the Geisha's Garden went to VQF sort of by default though. It was the only eligible quilt I had. It is quite ridiculous that they require that the finish date of the quilt you enter be from Feb of the previous year -- a mere 16 months old at most. But...that is their rule, so we all live with it. All of my 2015 finishes were away at NQA. This quilt was the only one left. Sophie worked so hard on her MQX quilt, only to discover in about December that it would be too large for VQF. She then made about the smallest quilt of any usefulness so that she had something to enter. Why? you may ask...Because though the rest of us get nothing but a big bill and a ribbon for entering, the youth quilters win a sweet little sewing machine, compliments of Janome! Dave LaValley of Bittersweet Quilt Shop (of somewhere, NH) is giving it to her, and over 20 other kids. She also came home with a nice bag of loot containing a roll of batting and 7 fat quarters of Northcott fabric. Here she is with her new dresser quilt and yellow ribbon (yea...she hates the ribbon, but she's all about purple now. Pink is passe', and yellow never was in vogue! Go figure. Eight year olds are silly, even if she did tell everyone that asked that she was nine! I got to meet Nancy Cooledge from Hancock, ME. She's a lady client that mailed me a quilt last summer (above). She had her's in the quilt show, and it had a nice yellow ribbon on it! She was very happy. And my client Wendy (from seacoast NH) sent me the quilt below the previous winter to quilt, "Nantuckety Day". It went to a couple other shows previously, and has gotten nice ribbons. I am happy for her to have the purple ribbon and a special ribbon for traditional quilt I believe. It's hard to believe a simple 9-patch chain gets enough points for a purple ribbon, but the judging here is different. No NQA. No certification of judges. No extras for originality and difficulty, I guess. Lots of points for overall appearance. The quilting on this quilt, subtle and not at all visible above, carries this quilt, along with its appealing color-scheme. It is always pretty to see it hanging. This is by Gladi Porsche. It has beautiful batik colors and hand quilting. This is the after-effect of duo Kathie Beltz and Mara Novak's MQX winning quilt Free Fallin. They decided to color it for VQF. Even though I like the original version better, the quilting is beautiful. It should have been recognized more here than it was (or wasn't!). I'd have to go back to the book for this maker. You know me, anything orange is appealing! It is sweet, and original, and has nice quilting. This is Christine Wickert's newest, all dupioni silk and hand appliqued, hand quilted. It's a pattern by a quilter who's name is just escaping me. I saw Flo Verge, another VT longarmer. I had Flo in a class at MQX, but she's pretty good. She had her own quilt here, as well as several clients. I liked this border specifically. We got to speak with George Siciliano a bit too. His uber-pieced minis are beyond borderline insane. Each 1" block has 10 times more pieces than I would ever consider using! I have a sample of his leave-in foundation though that I am going to order. Hopefully the days of ripping out papers are done! This has over 7000 pieces! Time to get sewing and make progress on some things! I am taking advantage of this early morning when 2 of my 3 kids are not down yet to attempt a blog post. I was quilting, and probably still should be. Heaven knows in 3 hours when I contemplate doing a little more stitching, it will be near impossible! Here's the last custom for a while. It's for a MA lady that has sent me 4 others this winter/spring. They all use many of these same fabrics. She requested dense stitching. The kaleidoscope block can be a pain, dealing with that center point where 8 triangles all come together. Mostly these did just fine, but every now and then there is a dimple. It will soften with use. This has a Hobbs wool batting, and I chose a medium gray/silver Wonderfil Master Quilter thread. The thread is a 40wt, but has less sheen than Glide. It mostly disappears on all but the darkest reds. I have started on a pile of nice, stress-free edge to edge quilt tops. I hope to have 5 of these done in the next 4 weeks. If anybody needs an edge-to-edge quilted, I do have openings for 4-6 more in August. During the kids' last week of school, I managed to get the outer borders added to this quilt of mine, but not without a little piecing drama first. I miscut that 2" green border too narrow, and ended up adding it in 2 pieces. That is just not how I do things; made me pretty angry! And I don't want to order fabric right now with our big vacation and all of its expenses looming. I have resorted to making a 1/4" silk bias piping to attach at this "joint". So, what should have been a quick and easy 2" border to add by machine, has turned into a fool's paradise of blunders and a dozen+ hours to hand attach the piping. Live and learn. I keep telling myself that it will look good. This quilt has small silk accents in some blocks, so this is right in keeping with what i have already done. Here's the newly squared up center star with its appliqued silk dots. I have been puttering with possible quilting plans too. This is really one of my favorite parts of the process -- past the trauma of all the sewing blunders, and before reality sets in that it is not quiltable! I am off to the Vermont Quilt Festival tomorrow. Hoping to see some good quilts! This post is a bit of a horn tooting. I am happy to share my successes, and techniques that I feel readers can benefit from. But generally speaking, I don't just post to say "hey, look what I did". This is different though. I have news of which I am immensely proud, and I really want to share it. This is my quilt, Bouquet Royale, hanging at NQA with it's new "Masterpiece Quilt" bling!! NQA has just about the nicest ribbons in the business! This week, my quilt Bouquet Royale, was awarded the Masterpiece Quilt Award by the NQA (National Quilting Association). If you are unfamiliar with this award, here is some information. There are 29 other quilts that have been awarded this distinctive honor since 1980. It is difficult to look at this list of quilters and see myself among the company of quilters like Diane Gaudinski, Sharon Schamber, or Linda Roy. It is very surreal. Earning this comes as a tremendous surprise to me -- so surprised in fact, that I started a post a day ago that I was going to share after the news of my NOT getting the award was known. Guess the surprise is on me. I've decided not to delete the text. Here's what I wrote. This post is one that I could very well just not make. To not say anything about this day would not alter anything for anybody. I doubt anybody knows that I have a quilt at NQA, and that it is being judged for a really big award, so to not say anything would not reveal anything. It would not announce "I failed". But to let this event in my life and career just secretly sneak by is treating it as though it never really happened, and it has. My Bouquet Royale quilt was judged along with a few others for the Masterpiece award. It did not get it, though. I never really expected that it would get it, so I'm not all that surprised to hear the news. I'm delighted to have been nominated, but that is where my elation gets to end for now. I teach my kids to have courage to take the good with the bad, so long as they give each event their best effort, so that is the approach I am taking. They are told "Those who try to do something and fail are infinitely better than those who try to do nothing and succeed". I made this quilt with every ounce of Me. It is a creative use of fabrics I love, bolder designs, and some daring chances on applique, quilting and binding. It is a good quilt, of that I am certain. It's just not a Masterpiece. That is ok, Am I sad?...certainly. And a touch disappointed. I know what this day would have meant had circumstances been different. The reality, though, is that I couldn't be happier, or prouder. A judge that I trust nominated a quilt that I made for the Masterpiece Award process. Does anybody really know what that means?!? It gives me shivers to type it. The Masterpiece Award is like the pinnacle of a quilter's resume. There are 29 of these awards that have been given since 1980 - only 29 quilts have achieved this status. OK, yes, probably many more, but 29 of the many which have actually been judged, earned it. I was one of the many that were nominated, and were allowed to have a quilt go through a 2 hour scrutiny by 5 judges. It sounds scary just thinking about how many mistakes I could find in that amount of time. Thanks for listening. Please don't give me your condolences. I am happy to be where I am. Having made something that is worth nominating is prize enough. Sharing my story with other quilters that, like me, are perfecting their craft, helps to show that none of us is perfect. Tomorrow I will wake and go at life with the same zeal that I did yesterday. That day will come when I will wake and the goal will be achieved. And that is ok. So here's what happened. Friday, in early April, while I was at MQX. I was getting ready for teaching a class when I received a text message from NQA judge Scott Murkin. He was one of 3 judges at the MQX show. As an aside, Scott is probably the one judge out there whose opinions I completely trust. 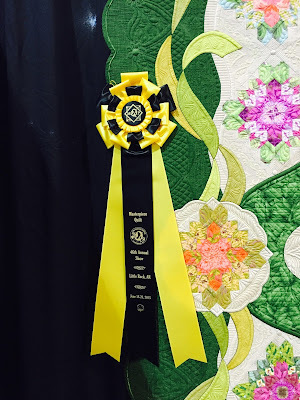 He has seen and judged nearly every competition quilt I have made over the last 5 years -- a total of 14 quilts (and two were actually judged twice because they didn't ribbon and then were entered at a subsequent show!). He's probably the best machine quilting judge in terms of experience level out there. If he told me it looked like crap, I'd fix it without question. He told me in April that he thought this quilt had a chance. I certainly wasn't about to question his professional opinion then. The message said that he wanted to nominate Bouquet Royale for the Masterpiece Quilt Award. I was dumbfounded, shocked, and a thousand other elated-am-I-worthy-enough-synonyms. I had a class to teach, and then I was heading home for the night. The one thing I knew, though, was that I had already entered this quilt at the Minnesota Quilt show, and I KNEW that the dates of MN and NQA conflicted. I had chosen MN over NQA for that quilt because of potential prize money. I really hate pulling quilts out of shows; it is poor taste. I had not, however, yet received the acceptance letter from MN, so I decided it would be ok. The other fly in the ointment here is that this Friday was THE last day to actually ENTER the NQA show, and if I was going to pull a quilt from a good show that paid well for awards, I would have to actually have to have it entered in the NQA show too (paid only for Best of Show awards). After driving home to Maine that night, I did get it entered at NQA, with barely 2 hours to spare before the deadline. In my mind I knew that winning this silly award was a huge long shot, but nothing ventured, nothing gained. I could re-enter MN next year. I could have waited until 2016 to have it reviewed for Master Quilt, but the wait would have driven me nuts. All the what-ifs crept into my mind...What if I drop my coffee on it? Furthermore, if it didn't show well at a year's worth of shows, I would feel pretty stupid sending it to the Masterpiece review! As it turns out, it did well at the only other show it has entered, winning BOS, so I at least had a confident feeling when it was mailed last week. I tried very unsuccessfully not to think about the judging the last 2 days, despite seeing a picture on their FB page which showed my quilt's backside. I was expecting the call tomorrow morning, thanking me for allowing them to judge it, and how pretty it is, and how well they all know it will do at other shows...yaddy, yadda, yadda, etc. I never, NEVER expected to get the phone call I got tonight, saying it won. And the part about how they all loved to touch and fondle of for 2 hours was kinda cool too. And those simple words, "You have a Masterpiece Quilt". I am over the moon with pride, and where my quilting has gone in 5 years. As I type this, I can't actually go public for 2 days. It seems excruciating to have to wait, but their awards are Wednesday evening. I still don't know if it placed, but that will come soon too. The other surprise I got, which I just learned of Wednesday afternoon is that my small quilt, The Jester's Folly, took the Best of Show for the small quilt category (dang that ribbon is big!! All the "stuff" covers a quarter of the quilt!)). Three awards in the show pay a $500 prize - BOS in three different sizes. My Bouquet Royale was lucky enough to get the Masterpiece Award, but the other Masterpiece Award recipient also had a large quilt, and her's took the BOS. It's a great show no matter how you look at it! 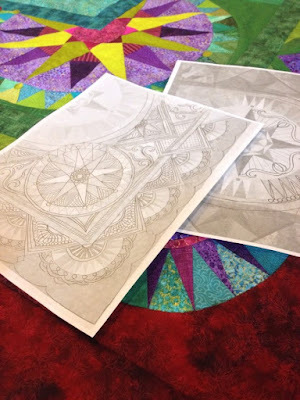 Mary Buvia's Masterpiece quilt did not take the large quilts BOS, as I wrote yesterday. I assumed this, because mine had not won it. In actuality, a different quilt altogether won it. If your eyebrows are raising, you are not alone. Mine have done so as well. Let me explain the judging process a little. The groups that judge the Master Quilt nominees and those that judge for the "show" are different. I told you about the Master judging earlier. Typical show judging is like this - 3 judges (and yes I know who they were) spend on average about 5 minutes per quilt at most. The 3 Master quilts come back into the regular piles of show quilts for a second judging. These 3 show judges probably know who was up for Master review, but they do not know the outcome of the evaluation. 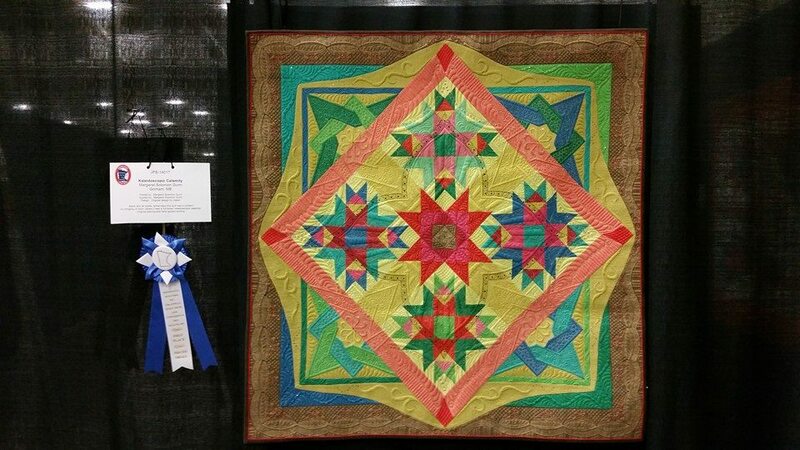 So...in the large quilts category, a completely different quilt was chosen for BOS. It was not subsequently nominated for Master review, which the judges can do to a couple quilts from the show, at their discretion. My Bouquet Royale took 1st in it's category (large quilts, mixed techniques). The other large category Master quilt did not place whatsoever. I am still trying to process how NQA can find all of this palatable. I find that if this other quilt was good enough to beat 2 Master quilts, why wasn't it bumped for Master review. I also struggle with how not having my quilt take the BOS muddies the intensity of the Master Quilt award. Don't get me wrong, I would have loved the BOS and the cash it brings, BUT I am not whining about this. 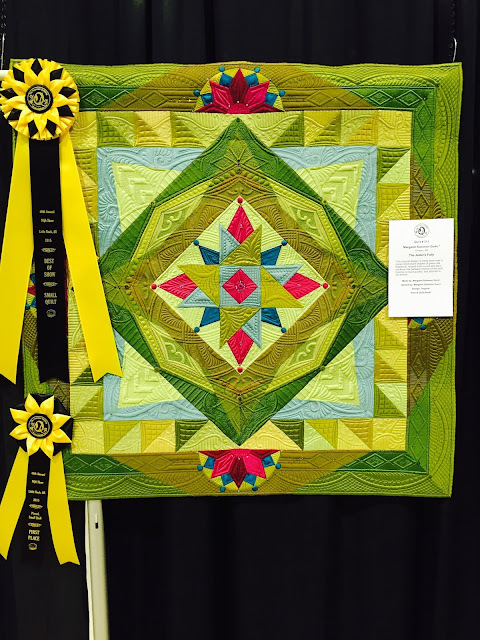 I am seeing it as a confused viewer that on one hand sees that the Master Award as "ribbon in the highest", yet another quilt clearly beat it. Hopefully there are enough people at NQA that can see this too. Their process, though it seems to be fair on the surface, needs checks and balances for when the 5 minute judges come to a different outcome than those that spend 2 hours. JMHO, and I welcome your's. mid-June...one week of school left, and LOTS going on here. We have daily baseball games, concerts, field trips and other events as school is coming to a close. One of my boy's baseball season ends this coming week, and one is just starting up this week. This is my last custom for a while. This is the Neimeyer Feathered Star pattern. I have done a couple of these previously. This one is a bit different because it has this incredible background fabric. The spotted background (which name I forgot, but you can get from Jackie Kunkel at Canton Village QW) is visually interesting for a quilt, but seriously, it is blinding if you are the quilter! It is a complete challenge to make whatever you choose to quilt show (or to even see what you are quilting!). I used a royal blue thread on that area so I had a chance of knowing where I was. Other areas were mostly quilted in coordinating color thread to the section. I used Glide threads. The sheen of this type thread looks nice on batiks. My client sent a wool batting. We made an attempt to be able to see the relief of the quilting on the heavy print! Mostly, sections of "feathers" were ditch stitched, then some part of them was outline stitched to add texture. Then the backgrounds were quilted, each differently. Lots of flames, waves and curls. (above) As you can see, I did try to make the background interesting. I have done this feathers and curved-cross hatch previously on this quilt, but dangit if it wanted to show! It does show up on the backside tho...The back is a mottled black/blue (not brown as the picture indicates). A good bit more is visible on the back than the front. The outer border is here, showing a bit more of the quilting - some large bubbles by outlining the circles, flames and parallel lines. My garden has decided to bloom. The white peony just opened this morning (really, I love the irises in the background). My many gardens have no shortage of irises. The background is all iris, beyond the lilacs that are full of blossoms this year. The many sizes and shades of purple iris. Here's a late week finish for a local client. These are all semi-nautical fabrics in a somewhat modern setting. The options commercially available for a nautical pantograph are somewhat chintzy and novelty-ish, so I resorted to a wavelike pattern. I added the binding, and it is ready for a pickup. The shows are active this month. It's a good thing I have 9 active show quilts still! This little bugger is at the Minnesota Quilt show right now, sporting a little blue-bling. I didn't expect that whatsoever. 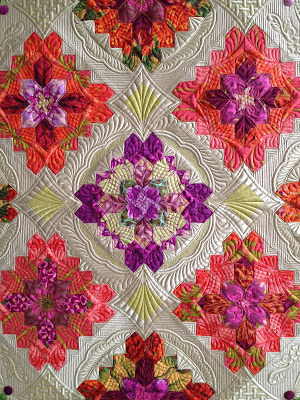 Next week is the NQA quilt show. I have 2 quilts there. This is the first year that this show has given cash awards, so the attendance may be a high caliber. Either way, I try to enter each of my quilts there because the judging review from 3 certified judges is exceptional. Every quilter that is looking for accurate feedback should do this. In two weeks is the Vermont Quilt Festival and the Shipshewana Quilt Festival. VQF doesnt pay squat, but it is close to me -- a mere 4 hour drive, and I decided to go this year. Shipshewana has nice awards and I have 3 quilts going (Big Bertha, Zen Garden and Autumn's Surrender). Fingers crossed for a little vacay spending $$. I have a Neimeyer quilt on my frame that will be finished in a day or two, if I buckle down and put my nose to the grind. I know that this view below doesn't change much weekly, but here's my stockpile of hexagon blocks, awaiting inspiration on a setting. They just seem too modern and bold to set in a comventional white or ivory background, but what to do has not come to me yet. Here's a closeup on the latest two blocks...This one is wild and I love a wild-child! This one is great too, but a tad more tame. That's ok.
With 2-1/2 weeks of school left for my kids, I am happily sitting in a good place on my purple whole cloth quilt. Every spring, I try to get the quilting on one of my show quilts at least started. Generally I begin this process in April, but this year it was a bit later. This is the 3rd time I have put this quilt onto the machine. To quilt it continuously, without removing it, would require a minimum of 4 weeks, and I don't have that kind of time. I have some clients patiently waiting for quilt, and the majority of these will be quilted in the next few weeks. When working on my own stuff, I am notorious for over-thinking designs and stitching patterns, and then consequently, wasting all kinds of time ripping out stitches. The past 3 days, I have been stitching the outer border. It's 3-4" wide, and has a line pattern like what I show here. I am barely lukewarm about the fills I used, but that is well beyond what I wish to rip out. I used these because I used them in another place in the quilt, so it seemed logical. Repeat, resize, reuse - we all know this motto of good design. So I kept thinking that I wanted the deeper tone of this dark purple thread to show more. It is in the center of the quilt's medallion, and shows nicely. That stitching, though, is denser. So, I tested up a sample with densely filling the center of the 3 1/4" stripes to see if I liked it. Turns out I do like it, and it gives the border both more color and more texture. It is in keeping with my "quilt it to hell and back" rule. Or, why take the easy road if there is a hard one. You know what I mean! Definitely, it is more to my liking. I'm not sure if the binding will remain straight, as the quilting is showing, or if some fancy-dancy curved binding will ensue. OK, yes I do know. I've been itching to use this herringbone pattern on a quilt for a while now. In retrospect, I should have written "I've been clawing out my eyes because I used this herringbone pattern"! It is stitched on a 1/4" grid, which must be very carefully marked. Did you know that if you are stitching on a 1/4" grid, it is very hard to see anything underneath a 1/2" hopping foot?! Sheesh (taken from my oldest son, who uses this "sheesh" on me routinely), who knew?! The first of these patterns took nearly 3 hours, but the other 3 were barely an hour. Good thing or there might have only been one. I really like using patterns that relate to the design of the quilt, and this one is like that garden path. I'll leave you with a couple more peeks. Here's the center...I added a little stitching around the periphery of the tulips to hopefully make them pop a bit (I know there's one area not done - I have a small tuck on the back to remove first). This is a very close-up pic. All major motifs (scrolls and feathers, most flowers) are stitched using a 40wt pink Glide thread. The color is Passion to be exact! I have 3 different 100 wt silk threads that are being used for the backgrounds. This is in a matching deep pink. It shows a nice contrast of the positive relief and the negative background colors. The section just outside of the one shown above has this very dense matchstick pattern that rays outward, and has 45degree lines at about 12 per inch stitched. The angle adjusts in each ray to maintain them at 45 degrees. It looks freaking awesome! It is stitched in a deep purple 100wt silk. It doesn't really look purple, but shows deeper. The section to the far left in the following photo is done with a lavender silk - the closest match to the fabric. It mostly blends away. The dragonflies are stitched in a lavender metallic thread from Wonderfil, and will likely get some paint to accent them before the fat lady sings. And lastly...(below) the outer borders, one stitched in tight pink lines and the outermost in the deeper purple. The contrast is evident in person, but maybe not so much so in the photographs. ...And my very pink backside. As much as I swear that using a freakishly busy print will make my job easier, I can't ignore the little voices in my head that love the look of a solid back. Besides, I'd have a helluva a hard time finding the mistakes that need fixing if I had a print!